In the wake of more isolationist political thinking in the West, with many developed economies turning inward, China is reaching out, seeking stronger trade and investment links with its economic partners. China’s Belt and Road initiative (BRI) is a prime example of this reaching-out policy. Under the initiative, China aims to trigger demand for materials and goods at home by investing in strategic infrastructure projects abroad, growing economic ties along its old Silk Road to Europe and along newer maritime links in and around Asia and as far away as Africa, covering all potential points in between. At its heart, the plan is to enhance global supply chains primarily though debt-financed infrastructure projects, across more than 60 countries. China expects annual trade with these countries to be worth $2.5 trillion within a decade – up from $1 trillion in 2015. Given the economic importance of the Association of Southeast Asian Nations (ASEAN) to China, and its geographical proximity, a key focus of the Belt and Road initiative is its burgeoning economies. Formed in August 1967 the ASEAN region is one of the most developed economic zones in the Asia region and the world. Last year marked the 25th anniversary of the open-dialogue relationship between China and ASEAN. 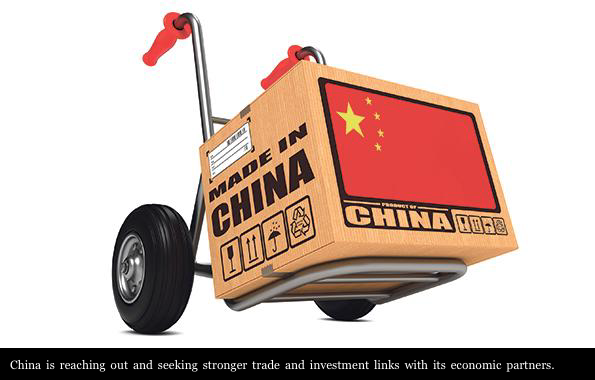 Economic relations between China and ASEAN economies have been growing strongly. By the end of May 2016, the two-way investment had exceeded $160 billion, with ASEAN remaining a major destination for Chinese companies. Bilateral trade has also increased 60 times from $7.96 billion in 1991 to $472.16 billion in 2015. ASEAN and China are seeking to double their trade value, setting a target of $1 trillion by the end of 2020. Belt and Road initiative will play a key role in this, further bringing together two of the world’s most dynamic economic regions by strengthening economic linkages amongst the 10 members of ASEAN, as well as between ASEAN member countries and China. If major Western economies really are going to roll back on their traditional global economic links, China’s Belt and Road policy is set to fill some of the openings that are set to develop. For ASEAN member countries, the initiative will help address an infrastructure deficit, and lift industrial development. While the formation of the ASEAN Economic Community (AEC) a year ago is bringing southeast Asian economies together as a single market and production base, the Belt and Road initiative will offer further integration by developing physical infrastructure and a robust trade regime. The region will be ideally positioned to sit at the centre of global value chains. For China, the Belt and Road initiative will provide an ideal platform to develop ties with neighbouring Asian countries while fostering the development of its own extensive high-speed rail network as a means to export high-end technology and services. With more than 20,000 kilometres of track laid, China has more high-speed rail than the rest of the world combined. The effort has already made some practical achievements. Among the countries of ASEAN, Malaysia, Thailand, Laos and Indonesia have joint Belt and Road deals with China, mainly in railway construction. There will be a new high-speed rail line running from southern China through Laos to Thailand’s industrial eastern coast. China has given a new pledge to cash-starved Laos for the construction of a $6 billion railway project linking Laos’ capital Vientiane to China’s southern Yunnan province by 2020. Once operational, the railway will be Laos’ longest and fastest, with an average speed of 160 kilometres per hour and 60 per cent of the line being bridges and tunnels. Meanwhile, the 7,000-kilometre Singapore-Kunming Rail Link (SKRL) is already taking shape. Beijing has also won the contract to build Indonesia’s first national high-speed rail link – a $5.1 billion, 150-kilometre rail project connecting the capital Jakarta to Bandung, Indonesia’s third-largest city. Infrastructure financing until now has been a challenge for most of ASEAN countries. With the exception of Singapore – which has a highly developed infrastructure base – and to a lesser extent Malaysia, the nations of Southeast Asia are by and large confronting major infrastructure financing deficits. Indonesia for example, the largest economy in southeast Asia, now spends just two to three per cent of its GDP on infrastructure. However, the need for better roads and railways for long-distance distribution and improved urban transport is quite evident. Fortunately for China’s Belt and Road initiative goals, seed funding for infrastructure projects along the Belt and Road has mainly come from the Chinese government with support from the Chinese commercial banks. China has also set up three new financial institutions to help fund the Belt and Road infrastructure goals: the Asian Infrastructure Investment Banks (AIIB), the New Development Banks and the Silk Road Fund. Between them these three institutions have a registered capital of $240 billion, and they are starting to become active investors along the Belt and Road routes. In addition, more than 300 Chinese funded enterprises have been set up in 26 economic cooperation zones in eight ASEAN countries, investing a total of $1.77 billion by October 2016. Even these combined funding capabilities cannot fully meet Asia’s immense need for infrastructure financing. The Asian Development Bank estimates that $750 billion a year will need to be invested in Asia between now and 2020 as developing nations strive to raise their economic productivity and deal with rising urbanisation. However, Beijing’s drive and financial commitments are sizeable, and will have a significant impact across southeast Asia. Belt and Road is an historic initiative of colossal scale and ambition, setting out a vision for China’s investment in the coming years. Implementing the Belt and Road agenda will require a high level of mutual cooperation, understanding and trust. But with careful analysis and handling of the regulatory, political and financial risks involved, it will provide southeast Asia and China quality and long-lasting economic growth – especially in these times of global uncertainty. Peter Wong is deputy chairman and chief executive, The Hong Kong and Shanghai Banking Corporation Limited.